SAN FRANCISCO, Jan. 24, 2019 – Ford and Lincoln dealers in the United States gave nearly $100 million and more than 500,000 hours to local causes and nonprofits in 2018 – according to Ford Motor Company’s annual survey on dealer giving. The survey coincides with the 19th annual Salute to Dealers Awards being delivered at the 2019 National Automobile Dealers Association Convention and Expo in San Francisco. The generosity of Ford and Lincoln dealers is reflected in how much so many of them give. The largest percentage of respondents, 38 percent, selected the highest giving category of donating $50,000 or more for the year. In the survey, 99 percent of dealers said their teams give time or money to local causes. Most said they are driven to make a difference in their communities because giving is a part of their dealership tradition. Dealers give to causes that address a broad range of community needs – from children’s charities to the environment, from education and healthcare to parks, municipal services and disaster relief efforts. Children’s causes top the list, with 80 percent of responding dealers donating, followed by 69 percent giving to education and scholarships. Veterans causes make up 50 percent of dealer donations, while 46 percent participated in initiatives focused on police, firefighters and other first responders. In a year that included many natural disasters – from hurricanes to devastating fires – nearly one-quarter of the dealer body contributed to related relief efforts. To demonstrate Ford’s commitment to its thousands of dealer owners who step beyond their showroom doors to make a difference, in 2001 the company launched its Salute to Dealers Awards. This year, Edsel B. Ford II and four other judges selected six winners from a global field of nearly 65 nominees from the United States, Canada, Brazil, Europe, Asia Pacific, Mexico and Central America. As part of the award, Ford Motor Company Fund and Community Services is donating $10,000 to a charity of each dealer’s choice. 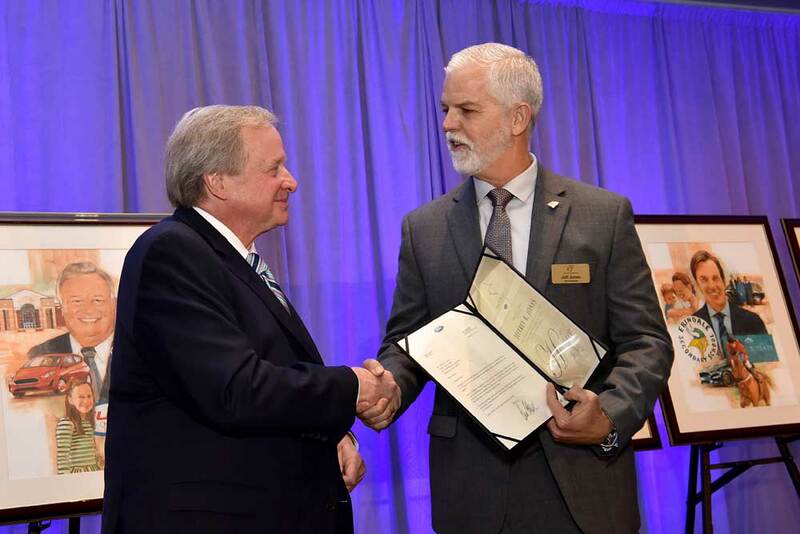 Jeffrey B. Jones, President & COO of Triple J Enterprises, Inc., is one of six recipients globally, recognized for their unparalleled generosity and commitment to their community. This was the first year Guam was given opportunity to be nominated for the program. For decades, Triple J Auto Group has sought to improve lives and build better communities through its work with nonprofits and individuals. It has supported cancer research and patient services through the American Cancer Society, and care for the afflicted and their families through Guam Cancer Care. Jeff Jones is actively engaged in outreach, providing funding and vehicle support for the Guam National Youth Football Federation, which encourages academic achievement, respect for authority and community involvement. As part of Ford’s Global Week of Caring, Jones and his employees provide landscape maintenance, power washing and other assistance at Guma Trankilidat, a housing project for low-income elderly and the physically disabled. Their annual 5K family fun run generates funding for American Red Cross, Make-A-Wish® Guam, CNMI and many other causes. Whether helping the homeless with basic necessities, assisting in patient care or supporting education through investing in the local university, Jones’ philanthropic reach is all encompassing. 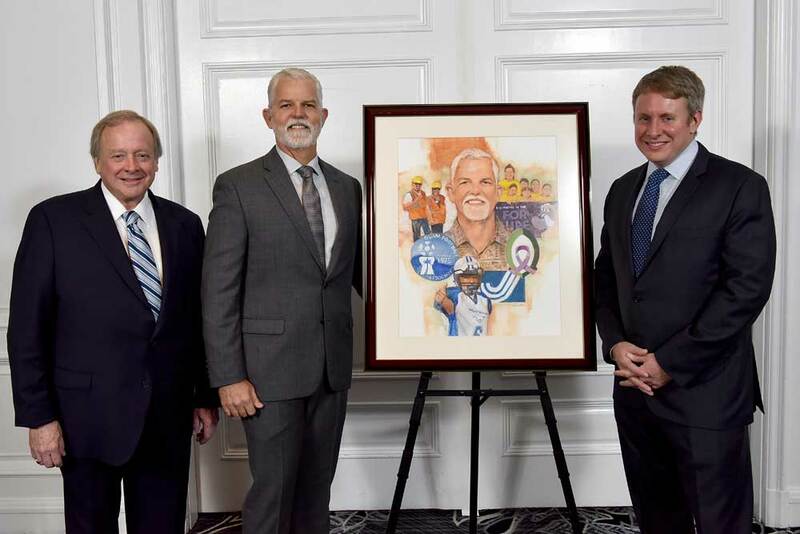 A painted portrait of each honoree features a montage of the philanthropic and volunteer activities that led to the award. Duplicates of the portraits will join a Salute to Dealers display in the lobby of Ford World Headquarters in Dearborn, Michigan. 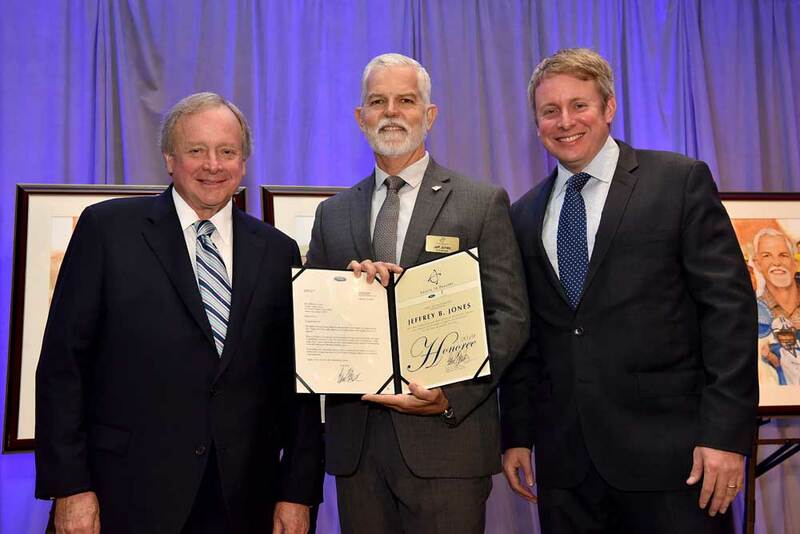 Photo Caption: Edsel B. Ford II, left, and his son Henry Ford III recognized Jones (center), one of six 2019 Salute to Dealers honorees, at a reception held Thursday, January 24, 2019 at the Ritz Carlton in San Francisco.